This 3-part Cash Receipt Wire Bound Book has information printed in Blue Ink. Imprint your company information in 1/2 in. x 2-1/4 in. print area. 150 cash receipts per book, three cash receipts per page. 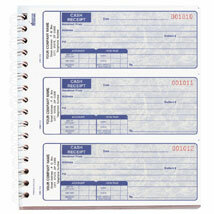 Receipt books are sold only in quantities of 5.